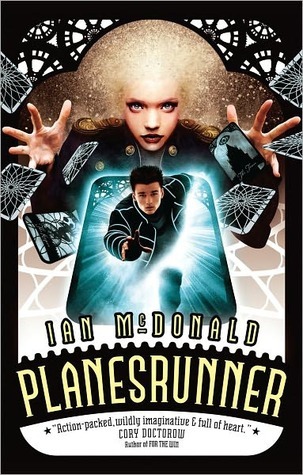 When I saw what the theme was for this week, my mind immediately went to the US cover for this book, mainly because Planesrunner is never too far from my mind. 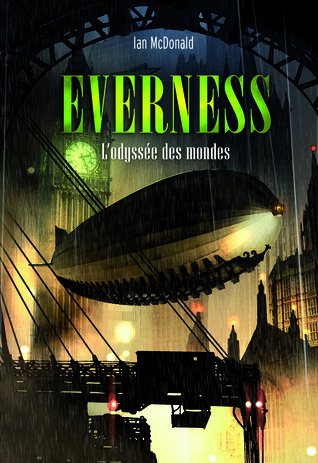 It’s an amazing novel, the first of a Young Adult series called Everness, but don’t write it off just because of the YA tag — this is a smart, unique, and entertaining universe-hopping steampunk adventure like no other, and I’m glad to finally get the chance to gush about it. 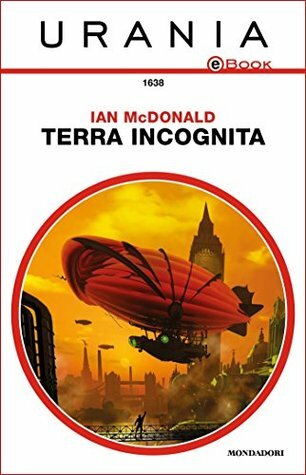 I just wish I knew whether or not Ian McDonald is planning on writing more for this series, because book three was the latest one to come out and that was in 2013. 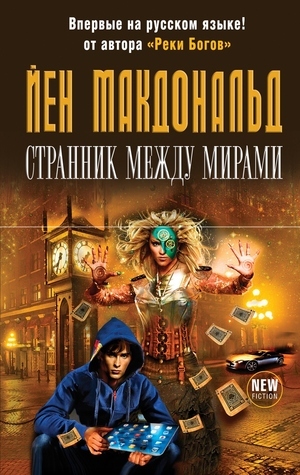 The Russian edition is the only other cover to feature playing cards. 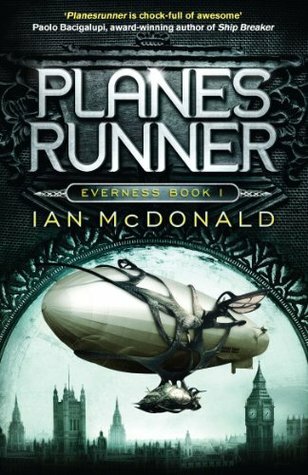 The rest show the eponymous airship Everness in all her glory. This was a tough one. 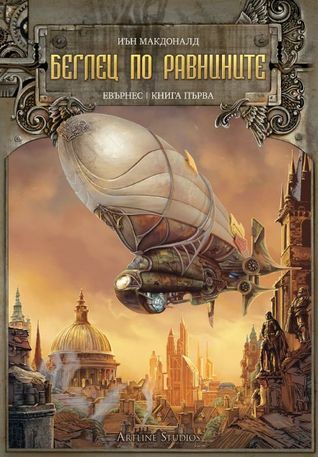 My eye for aesthetics went immediately to the Bulgarian edition, because damn, that’s just beautiful. At the same time though, my heart refused to relinquish the Jo Fletcher Books UK cover, and all because that’s the edition I own. Oh well, stubborn hearts win out in the end! I agree with you that the Bulgarian and UK covers are the most beautiful, but I think I still have to pick the Pyr edition on the right. I love how the kid is coming out of the doorway, and the cards flying around.. It screams Chronicles of Amber which gives it my full and immediate attention. Now I’m off to search for your review of this book because at first glance it seems very interesting! That’s probably my second choice. So pretty! I’m going with the russian one myself. The ones with all the airships, too steampunky for me to ever want to pick up. I’d look at the russian one and go “hmm, lets try this”. Excepting Butcher’s latest series, I tend to avoid it. The couple of times I tried it it came across as very “fan’ish”. I think I’d pick the Bulgarian one though I also like the design of the UK one. I just like the Bulgarian colours a bit better! Totally agree, I love both for the reasons you listed! I love pretty much all the covers except the US one haha. The UK one stands out as the most unique, though- I’ll have to go with that one! I don’t think I knew about it but I agree about the winner! Not a fan of the two covers with cards on them at all. My favorite book with cards on the cover is Laura Lams Shadowplay. Not that anyone asked, but it was the first one that came to mind for me. Oh man, I totally forgot that the cover of Shadowplay features playing cards! I haven’t read that one yet though, so it wouldn’t have felt right for me to feature it anyway. One day though, one day, I must continue that series. 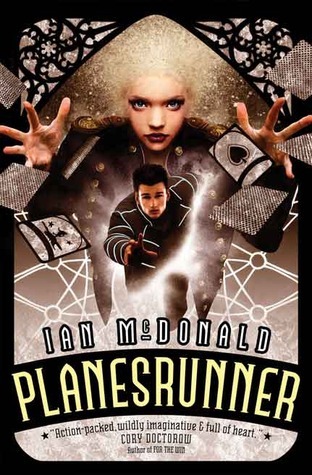 I LOVE that grey-blue cover of Planesrunner! I’d not seen it before. Hmmm, playing cards on covers… the only book I can think of is Queen of Hearts by Colleen Oakes (and the rest of the series). I do like those covers!